In a previous post, I made an ice cream from a toasted ancho base. Before adding the sugar, it struck me how delicious the steeped milk was in a savory way. Since then, I have been trying to think of a way to incorporate this into some sort of meat or vegetable dish. I remember a while back I made a coconut milk braised pork dish that came out great. I took the same idea and decided to braise with ancho milk. Looking around I noticed that there were several recipes for milk braised pork, they looked delicious and I was excited to get going. To start, I toasted ancho and pasilla chiles. While to me they both have a raisin type quality, anchos are more fruity with bittersweet notes, and pasillsas have a more earthy quality to them and seem slightly sweet. I love how the ancho gets a deeper reddish brown color when toasted. 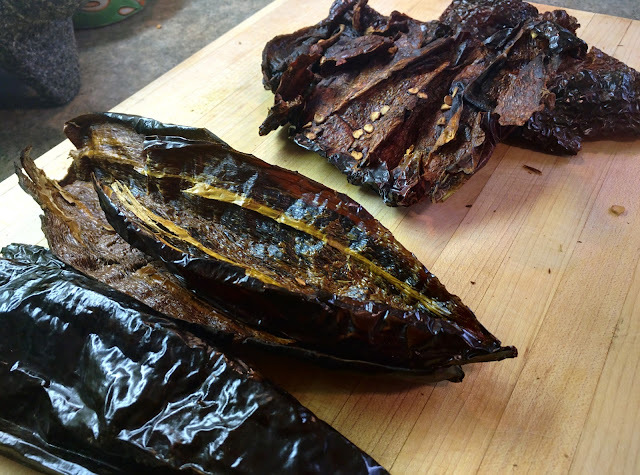 The inside of the pasilla turned almost golden and tobacco brown the more they toasted. Careful while toasting darker chiles, because it is hard to distinguish their normal deep colors from just burnt black. After toasting and cooling for a couple of minutes after removing from the comal, the chiles can be broken up into pieces. I broke them up into about 3 cups of half and half, brought up to a simmer and let them steep for 20 minutes. The resulting color is somewhat like a very light café con leche, maybe more on the tan side. I wound up straining and pressing the chiles through a chinois to get as much of the flavor out, but for braising I think blending would work as well. I removed the steeped chile mixture and seared my pork shoulder in the pan on both sides until browned. Once I removed the pork, I added some sliced onion and garlic before returning the milk mixture to the pan. 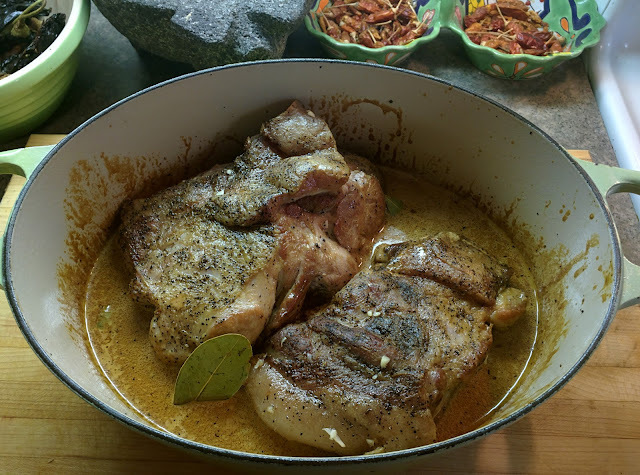 I placed the pork shoulder in the pan along with a few bay leaves and cooked at 325 for 4 hours, making sure to flip the pork every 30 minutes. 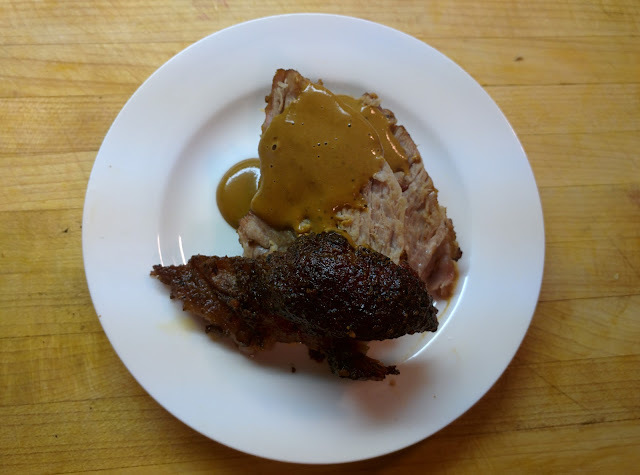 This was absolutely delicious, the pork had a fantastic texture and reminded me of carnitas in places, the outside of the pork got this dark caramelized color. My favorite part was the aroma and complexity of flavors the chiles provided to this, it all came together nicely. As a result of the braising process, the milk cooks down and is just reduced to these caramelized milk solids that are infused with the flavors of pork and spices. I used an immersion circulator to blend and break these down. Once blended, delicious creamy sauce is created for spooning over to top.